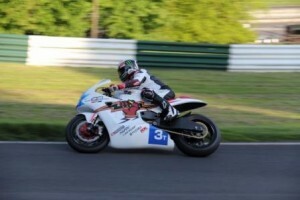 The final test of the MUGEN Shinden before it leaves to make the debut appearance of MUGEN at the Isle of Man TT Zero event took place at Cadwell Park this week. With perfect timing the Summer weather arrived in Lincolnshire as rider John McGuinness silently rolled out of the garage to give the Japanese designed and built EV machine its first taste of a UK circuit. With never having competed at the Isle of Man TT before, MUGEN will be arriving on the island with no experience of this unique venue and no databank to call upon, therefore every kilometre covered is precious to the team engineers. 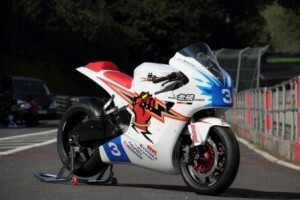 The MUGEN Shinden is a unique design aimed specifically at the single lap TT zero event, and so no spares are available for key areas of the bike and bodywork other than those the team manufactures itself. So with these factors in mind, although the TEAM MUGEN entry for 2012 is for a single machine and rider, the team took the decision to take their spares package and build them up into a spare bike for testing and data gathering. This meant that over the two 2.5 hour sessions the team was able to run through twice as many strategy options and enable both team and rider to rapidly start to tap-in to the machines capabilities. At the end of the final session on day 2 both bikes had each run faultlessly and harvested enough information to enable the MUGEN engineers to compare the endurance and speed experienced in real-time with their own simulations which will all help to determine the team’s approach to the race on June 6th . The bikes will now be packed ready to leave for Isle of Man next week.